I use a lot of spices. We like food with plenty of flavor around here, so I go through spices in bulk quantities. Years ago, I figured out that buying them in bulk was the way to go. Most of the cost of spices at the store is in the packaging. But store bulk spice sections can sometimes have old spices, or mixed. Often as not, the very thing I need right now is out, and won’t be stocked for a week. Then I discovered a gem of a place at Pike’s Place Market: Market Spice. If you’re ever at Pikes, and you haven’t gone to Market Spice, go. It’s an experience. Plus, their stuff is top notch. Years ago, Mr. Caffeinated made a business trip to Budapest, Hungary. We have a friend that is a native there, and she asked him to bring her back some paprika. He brought back a bunch (and had his luggage searched for drugs – I dunno what they thought when they realized all that red powder was a spice), and we made paprikash. My friend was ecstatic about having real Hungarian paprika from back home to cook with. Nope! It was my stash from Market Spice! If you just need to refill all your spice jars, and you want chef-quality spices but at bulk pricing, I’d say, get them at Market Spice’s website or (if you’re on the Eastside), their Redmond warehouse. There’s a minimum quantity required for the warehouse sales, but it’s usually about an ounce – which fills one of my spice jars pretty precisely most of the time. Call ahead; it generally takes them a day or two to put a ‘will-call’ order together. I used to call in my order, give them my credit card number, and then drop in and pick up my bag (takes about two minutes), double check it and I’m on my way. These days, I have it shipped. Shipping isn’t cheap – it cost me $10 last time – but the gas would cost me that much to get there from our new place. Their products come in cellophane packets; you have to buy your own jars elsewhere. I get my teas there as well; they have a zillion types. I know people that love their Market Spice tea, but I’m not a big fan of cinnamon in any hot drink but cider. They also have spice blends and coffees. 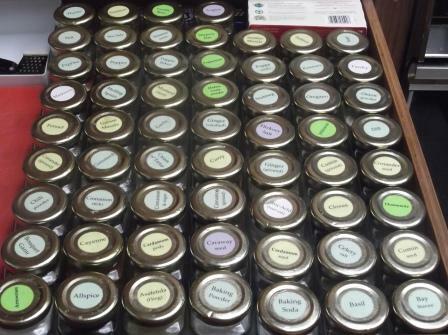 I recently made an order to fill a bunch of jars that had run out, plus to stock up on ingredients for various blends of my own. This order cost about $60, with shipping. 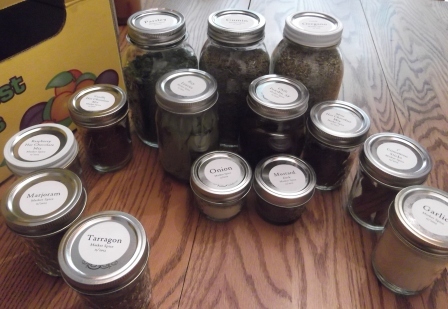 I store all my ‘extra’ spices – the refills for my spice drawer – in canning jars. Market Spice doesn’t have any idea that I’m posting this, but I often get asked where I get all my spices (and I have a few). This entry was posted in Allergy-Friendly, Baking, Beverages, Comfort Food, Desserts, Main Dishes, Side dishes and tagged bulk spices, Market Spice, spice jars, spice resources, spices, tea, where to buy spices, where to buy tea. Bookmark the permalink. Love your spice drawer!!!! Love how it inspired Melissa to get me jars for MY spice drawer 😀 haha! I need to order more, though … they are the perfect size! Yup – here’s the link!